انجمن نجات ايران : RAN: New Protests In Kazerun With Chants Of "Beware Of The Day When We Take Up Arms. RAN: New Protests In Kazerun With Chants Of "Beware Of The Day When We Take Up Arms. On Friday, April 20, 2018, thousands of residents of Kazerun, southern Iran, staged anti-regime protests for the fifth consecutive day. People also gathered in the city's grand mosque and denounced the regime's plan to divide the city. 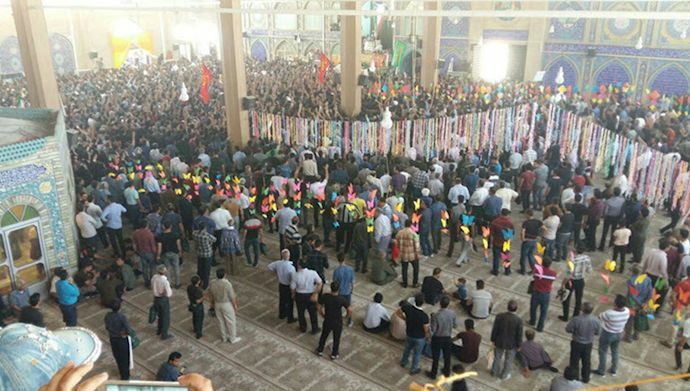 The demonstration was held while the city's so-called city council, Friday prayers’ leader, and state media had announced that all gatherings were banned until the Kazerun city separation plan is determined. Following the courageous demonstration of the people of Kazerun, some local authorities announced on Wednesday that the plan for the separation of Kazerun was being paused. However, people did not pay any attention to the regime’s promises and demanded the governor to respond.